This month marks twenty years since I left England for Granada. The years are rolling by now at such a runaway pace I can scarcely believe it’s been two decades. 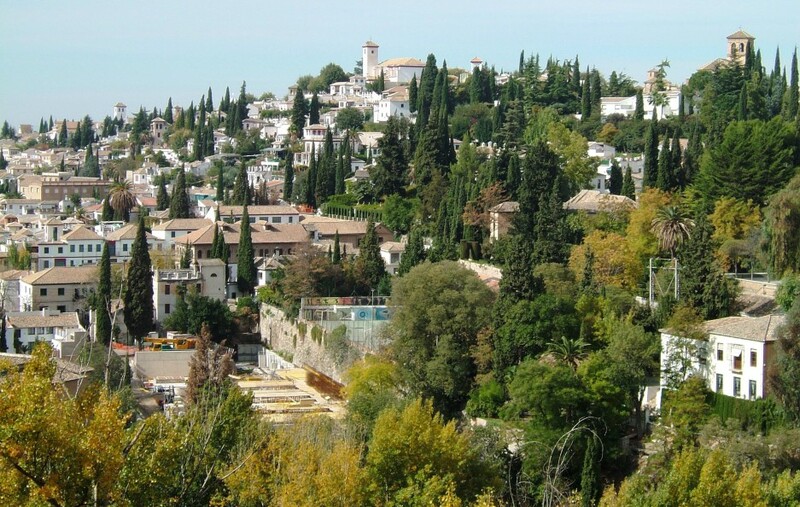 My first year in Granada, on the other hand, felt more like ten. One of the great benefits of major change is the way time expands, the freshness of new experience lending every moment a savour that marks it out. That year, 1999, stretched out with a miraculous elasticity: a collection of discoveries, impressions, experiences like beads on a string, each one precious, if only for what it taught me. Striving to live wholly in the present, I learnt to use my senses more fully, to appreciate more. The speed of time passing is one reason I dislike too much routine in my life. If you want to prolong time, routine is the enemy. Not that drawing out time is always desirable; sometimes I long to speed it up. When you’re in pain or waiting for something, time can drag interminably. I think the longest year of my life was the one following my miscarriage as I attempted to get pregnant again, my hormones screaming out their loss. Patience is not my best virtue but for a writer hoping to get published, it’s a necessity. Waiting for phone-calls, emails, other people’s decisions in any sphere of life can make every minute seem like an hour. Becoming a parent warps time similarly. There’s no comparison between the first month or year of your baby’s life (especially the firstborn) and a month or year when they’re at secondary school. Time plays other tricks too, cruel or kind. Looking back on my own life as I work on my memoir, it strikes me just how crucial timing is in so many aspects of our lives. Meeting the right person at the wrong time or the wrong person at the right time can ruin a life. Catching the zeitgeist as a writer or any kind of entrepreneur requires astuteness but also an element of luck. Getting it right can make all the difference between success and failure. Accidents frequently happen through the tiniest of misjudgements. A split second when life and death are a mere hair’s breadth apart. Timing is all. The opening of my novel, Secrets of the Pomegranate, shows Deborah and her friend catching a train by the skin of their teeth. The train is one of four targeted in the 2004 terrorist attack in Madrid, ‘the train of death’ as the press (in real life) later termed it. Had they missed that train, there would have been no story. Time can so often fool us, distorting the passage of time as we look back. Events that our brain places in the distant past may have taken place just weeks earlier if some dramatic interruption to our normal routine has occurred in the interim, while experiences from long ago may be so strong in our memory that they seem like yesterday. Watching a slide show of my overland trip to Kathmandu in 1974, taken by a fellow-traveller, transported me back to my twenties, the forty plus intervening years shrunk to nothing. My married years up to 1984, on the other hand, belong to a whole different lifetime. Writing from the point of view of Rose, the central character of The Red Gene, I had first to get into the mind of a girl in her early twenties. Seeing life through her eyes as she aged and was moulded by the experiences that made up her story involved accompanying her right through to her nineties. Having worked with older people in the past (decades ago but still vivid in my mind) helped me portray Rose in old age. I don’t feel my age or I don’t feel any different were phrases I would hear almost daily. What is forty or sixty or eighty supposed to feel like? Time impacts people in different ways. Assumptions about age and attitudes to it differ from one culture to another and even in the same culture expectations of age change over time. When I reflect on my twenty years in Granada, I don’t feel I’ve changed significantly although the world around me certainly has. The steep learning curve involved in settling in a new country has been tough at times but also energising. Maybe I’m a tiny bit wiser and know myself a little better as a result. I’ve become a grandmother (five times over). But do I feel my age? Of course not!